The acrylic sheet for the Meet Your Neighbours protocol has arrived. Thanks to Rob and Travis for setting me up with a support for the back flash and the plastic, and to Jesse for getting them in the loop. I am all set up in a multi-purpose room that is just perfect for what I need. Much easier to work indoors. This is not consistent with the meet your neighbours protocol, which calls for minimal disturbance – but these plants are past their flowering and seeding stage, and there is a specific educational component with the Monument, so it seems worthwhile bending the rules in this case. The chief ranger liked this image. It is a concept image for my deliverable for the residency. 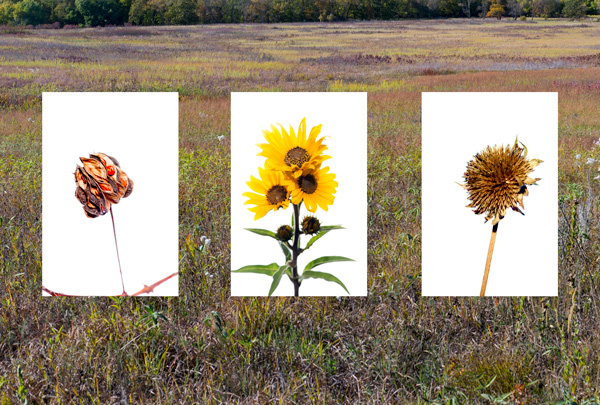 It shows three prairie flowers against a background of the prairie. As of yesterday, I have two weeks remaining at Homestead to prepare my second “public interaction” for Sunday, October 21. In Petrified Forest or the Rocky Mountains almost anywhere you look, there is a great photo opportunity. The least you can get out of those residencies is a “pretty picture” even if it doesn’t carry deeper representational or artistic meaning. Although I submitted a reasonably coherent project plan, turning that into an actual project deliverable, with some artistic and/or representational merit is proving more difficult. After thinking about it for several days, and writing about a third of the powerpoint I will use for my second presentation, I have decided to work on two projects to assure some level of success on one. The first focuses on the Palmer-Epard cabin near the Heritage center, and combining an exterior view, with a panorama of the entire interior of the cabin. I am not really sure how to make it “work,” but have plenty of time to play. The second project will be based on the “Meet Your Neighbours” website that I mentioned in an earlier blog ( www.meetyourneighbours.org ). 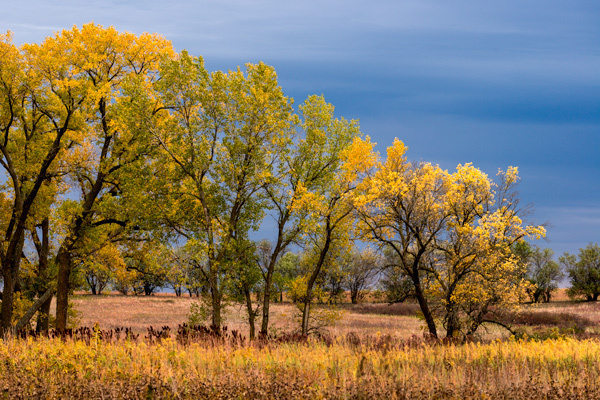 I have already ordered the white plastic and will take pictures of of prairie plants in their fall decline and use a diptych or triptych as my submission. The background white plastic should be here about mid-week, in the meantime I will take regular closeups and identify which plants I want to work with. There are many ways and places to publish your photographs depending on your interests, the type of photography you do, and how hard you want to work. Many people use Flickr, and some magazines and art directors look there when they need images. But Flickr is huge, and the chance that you will catch that kind of attention is relatively small. You can also establish your own website and/or blog. I use InMotion hosting for both. I think it costs about $85 per year; you can download both gallery and blog (WordPress) applications. I also have an account at www.pbase.com which is even less expensive, somewhere around $28 per year. If you want to get serious about selling your work, you should establish your own presence on the web. That said, I should note that I have never sold directly from my web site, but it serves as a photo resume and portfolio for people who might be commercially interested in my work. Most of my sales have come from small art fairs and to friends or co-workers. ZAPPlication.com has many listings for art shows and fairs across the country and links to the sites of these art fairs for details and applications. I think that CaFe is another similar listing. Jury fees are usually $25-30, but booth fees range from about $35 – $450. I print and mount my own work to save money and remain competitive, and to get exactly the results I want. I also do cards, but it is hard to make much money as cards usually sell for less than $5. Artist’s coops are another opportunity if there is one in your area. Usually there is some contribution to start, they take a portion of proceeds, and you need to gallery sit. You can also call private galleries and arrange for a portfolio review to see if they are interested in your work. Some wineries also host artwork. Art fairs are also a possibility where you have the greatest control. Although most are juried, if your work is reasonably professional, you will be accepted. If not, perhaps you need to re-think. Depending on your interests you can also submit to various publications directly. 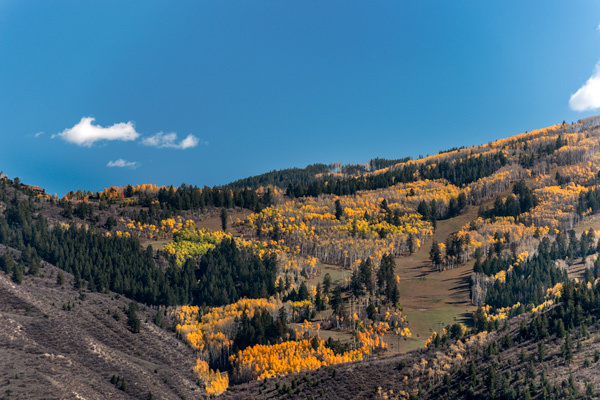 If you like to photograph images of fall colors for example, calendars may be a good opportunity. If you live in a small town, you might speak to your local newspaper publisher about travel or lifestyle photography. Alyson B. Stanfield offers a free artist newsletter that focuses on Art Marketing; you might consider signing up. I hope you find these suggestions helpful. Good Luck! Crossed Colorado as the aspens were going golden. Got to Homestead in Beatrice, NE two days early (10/2). This extra time gave me time to rest up from the drive, send out pictures from the wine dinner at Sorrel River Ranch and get my head together. Apparently some interns stayed a bit longer in the residence at the Park, so I get to stay in private cottage with all of the comforts of home: TV, washer and dryer, etc., except for no wifi. Got access at the Education Center at the Monument today, that is about a mile away, otherwise, I need to use the library as I did today, but that is about 5 miles away. Folks in town and at the monument are real nice. The monument seems to have a good relationship with the town, and on Thursday, I will help with a water quality lesson with fifth graders and there is a prairie seed collection and Art in the Park on Saturday, so I will be keeping busy. The photography opportunities are much less obvious than at Rocky Mountains or Petrified Forest, so I will need to work a lot harder at being creative. 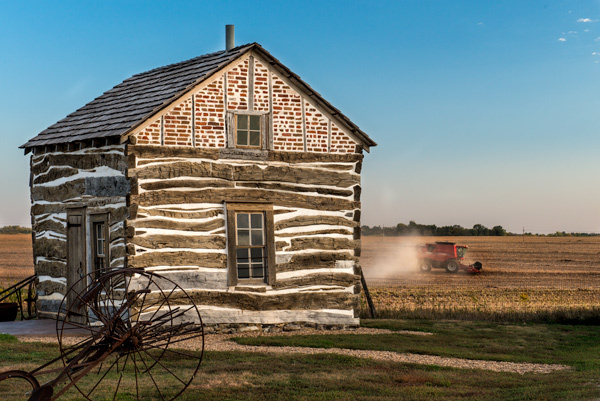 I will start with some of the old cabins and farm equipment at the Monument and possibly do a collage like I have started at Rocky Mountains.